HomeMan UnitedWhy are we so Fickle? You know what football fans can be so fickle some times. The amount of abuse i’ve heard today against Wayne Rooney for his apparent ‘loss of form’ over the past few months. Why do we not support our players and fully understand what they do on the football pitch. People like Gabriel Heinze can be criticized for their distinct lack of loyalty and professionalism, but really how can you have a pop at Rooney? Rooney embarrassingly dived against a Michael Dawson ‘challenge’ and was rightfully booked and he should get abuse for that. Diving and cheating should be outlawed from the game and although I don’t think much of Clattenburg, he made the right decision. But we all make mistakes. What about in amateur football when you claim a throw in that you know has come off your leg? Is that the same? My point is that Wayne Rooney is human, like everyone else and makes mistakes and I think that certain people have had a go at Wayne too much since Saturday. He may be in the shadow of Cristiano Ronaldo, but who’s shadow is Ronaldo in? 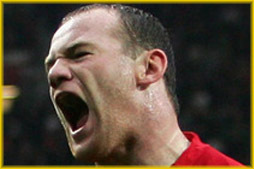 He is the best player in the world at the moment, so maybe people are just expecting Rooney to reach the same level. Rooney is a different type of player (obviously); strong, quick and has superb vision. The one thing I would say he has to improve on is his finishing, which has been a little too casual over the past few weeks. But being a forward isn’t all about finishing, Rooney is a number 10 and plays his best football off a main striker. We need to realise that footballers can’t perform at a certain level all the time. I remember a few years ago when a select few (shall we say) were asking for Fergie’s head. It’s the exact same fickleness that I despise in a football fan. Surely, we should stick by out original beliefs for some while? Of course we can change our mind, but demanding success season after season is unrealistic. United lost out to Arsenal and then Chelsea twice (who had the ultimate resource of money on their side). I think Ferguson did an outstanding job last season to over turn a Chelsea side that literally should have bought the league. Remember that Wayne Rooney is a top footballer who will go on to be one of the best players in the world and will continue to improve as a forward. He has shown that he is a leader (in 2005 we were literally a one man team at times) and has shown he has the quality to compete at the highest level. Give the lad a break and appreciate the qualities he has and what he brings to the United side. I’m open to a debate here so please leave a comment for discussion.